Rano Kau volcano - Courtesy © ALCE - Fotolia.com Rano Kau volcano. 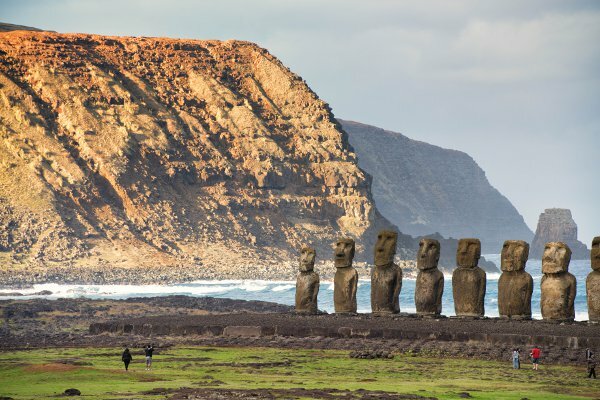 But we’re forgetting about a lot of other destinations and one of them is the remote island of Rapa Nui – better known to the greater public as ”Easter Island”. What comes to our minds more often are the ”big head statues” – this are the moai. And indeed, they’re the primary attractions on the island. Let’s take a look at what Easter Island is all about and how you can get there. This small, triangular-shaped island in the South Pacific, way off the coast of Chile (but still belongs to it), only has one town known as Hanga Roa, with roughly 3,000 inhabitants. It has a huge runway and receives weekly flights from Santiago de Chile. As we find out from an Easter Island guide, the triangular piece of land was first populated at least 1,000 years ago, perhaps even close to 2,000 years ago by a group of Polynesians who arrived here on 2 boats. Their leader was Hotu Matu’a – the first ruler of Rapa Nui. By the way – Rapa Nui meanins “navel of the World” in their local language (also known as Rapa Nui). The huge moai statues are scattered around the island like they’re standing guard, intimidating any intruder. It’s still unknown why or exactly how these huge monolyths have been contructed out of very hard volcanic rock. Europeans only arrived by a Dutch Roggeveen’s boat in 1722. Earlier, around the 1500s there could have lived as many as 15,000 people on Easter Island. It’s shocking to find out that: they overpopulated the island, used up all the wood, cut out all the trees and had no means to get off the island – no materials left to build boats, nor solid houses or shelter from periodical rain and strong cold winds. Cannibalism followed, panic and famine-driven vicious tribal wars. Perhaps the construction of the moai has a connection to these events. During only about 200 years, until Roggeveen’s arrival, the population had dropped from 15,000 to around 2,000. The moai statues constitute the main attraction on the island. 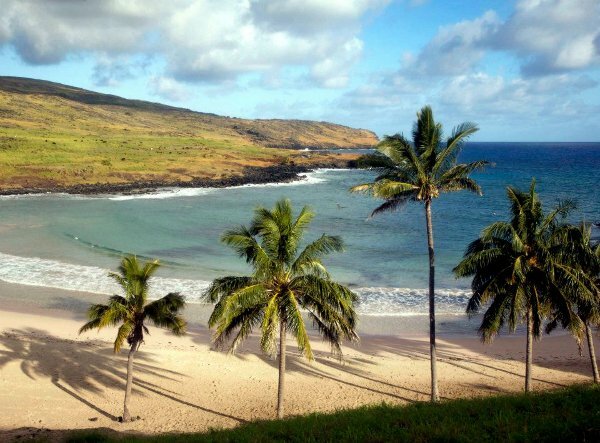 But the sheer beauty of the landscape is captivating, and there are beautiful beaches where you’ll find a number of (planted) palm trees. By boat or by plane. The latter is a lot more comfy, but quite expensive as well. You might get lucky and grab a 300 $ flight from Santiago, but usually you have to have at least 1,000 – 1,200 $ in your pocket. LAN Chile is the only airline serving the runway, which is huge for a small island like this (NASA built it for space shuttle emergency landing situations). Luxury hotels are also found in Hanga Roa, but there are small hotels and even friendly families who will accept tourists for a low to medium amount of money. Overall it’s not cheap getting there, but it certainly is worth it. Consider about 1,500 $ for a mid-range trip (with departure from Santiago) to cover transportation, sightseeing and accommodation costs. Today the island has some planted trees, but a beautiful almost forest-less island awaits the visitor. And, of course: about 900 moai statues! Most of these can be found all around, along the beach. It’s interesting to note that only until recently the fact these “heads” actually have bodies was unknown. The new archaeological evidence suggests the statues may actually be much older than earlier suggested. Apart from the statues, travelers enjoy hiking and exploring the three larger volcanoes on the island. Some of them have lakes inside of them. Bicycles, motorbikes even and 4×4 vehicles can be rented for trips. Or, you might want to walk on foot. The top attractions include: the Rano Raraku quarry (where they extracted the rock for building the moai), the Ahu Tongariki, Ahu Nau Nau and Ahu Akivi moai sites. By the way – the ahus are the platforms supporting the moai. 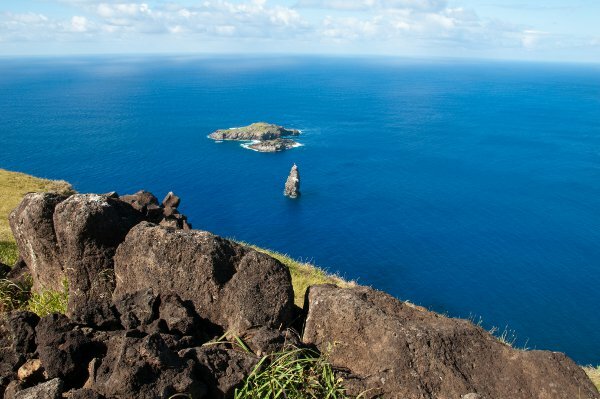 Rano Raraku is in fact a volcano cone, the views there are some of the best on the island. You’ll love to see the largest moai, which is almost 10 meters (33 ft) high an weighs 82 tons. Imagine a city bus standing vertically… that’s the approximate size! (Although, the largest moai was unfinished, it would have had a height of more than double that, but the islanders left it half-made – reasons unknown).